When we find our birds with loose droppings the first disease that springs to mind is coccidiosis. But what exactly is coccidiosis and how does it affect our birds? 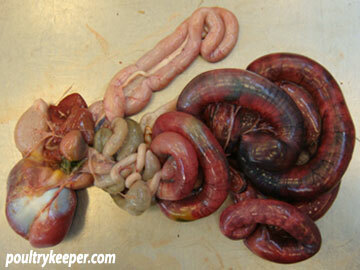 Coccidiosis is a parasite which damages the gut wall of chickens. There are a number of species of coccidiosis and their affects vary from harmless right through to life threatening. 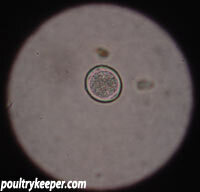 There are six species of Eimeria (coccidiosis) which are generally considered to be significant for chickens: E. tenella, E. brunetti, E. necatrix, E. maxima, E. mitis and E. acervulina. Each of these species prefers to live in and damage a specific region of the gut. For the purposes of treatment and prevention of coccidiosis it is unimportant to ascertain which species is causing disease in your birds and in many cases several species may be working together to cause disease. 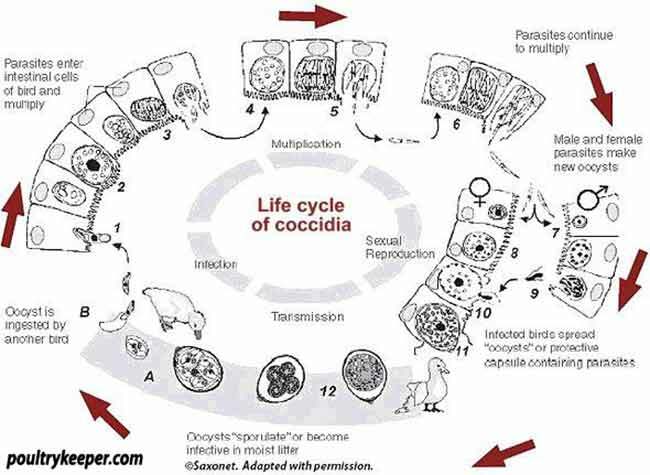 The life cycle of coccidiosis is important if we are to understand how to control this parasite. The life cycle starts with what is known as an unsporulated oocyst. Basically it is like an egg containing an early stage of the coccidiosis which is yet to develop. In this state the oocyst is unable to cause disease if eaten. The oocyst sporulates (develops so that it becomes infective) in as little as 24 hours under optimum conditions (a humid environment at 25-30 degrees Celsius). The oocyst has a thick wall which protects it from heat, cold and even common disinfectants. This enables coccidiosis oocysts to survive for up to several years and makes it difficult to destroy them. When the sporulated oocyst is eaten by the chicken chemicals in the gut break down the oocyst wall and release the infective form of the coccidiosis called the sporocyst. These sporocysts change into sporozoites which invade the cells of the gut wall and replicate. When the sporozoites have replicated in the cell, the cell bursts releasing another stage of coccidiosis called merizoites. These merizoites go on to invade and destroy more of the cells in the gut wall. Eventually the coccidiosis infection results in the production of more oocysts which are passed out with the faeces into the environment and can go on to infect other chickens. One of the problems with coccidiosis is that a single oocyst throughout its lifecycle can end up destroying several thousand cells in the gut. If a bird eats a few oocysts and only a few thousand cells in the gut are destroyed then the bird will not have any ill effects and will go on to become immune to coccidiosis. However if the bird eats large numbers of oocysts then millions of cells in the gut are destroyed. This is incredibly painful for the birds and causes them to stop eating and to adopt a hunched posture with ruffled feathers. The damage to the gut wall reduces the ability of the gut to absorb nutrients resulting in weight loss and diarrhoea. In severe coccidiosis especially where E. tenella is involved the damage to the gut wall can be so severe that the bird bleeds into its gut causing blood in the bird’s droppings and anaemia characterised by a pale comb and wattles. The aim of poultry keepers and vets is to ensure that birds are exposed to low levels of coccidiosis so that they build up immunity but not so many oocysts that they suffer the ill effects described above. What often can happen is that the first few chickens in the flock are exposed to a few oocysts and build up immunity however these birds act as coccidiosis factories and produce millions of oocysts which can go on to infect their flock mates. If the pen is not cleaned properly after the flock leaves the pen then the next flock are exposed to high levels of coccidiosis and suffer the adverse affects. In general immunity is not given from the hens to their chicks and the chicks will get exposed to coccidiosis in the first few weeks of life and will go on to develop immunity with or without clinical disease. One group of chickens which do not develop this immunity are battery hens as they are not exposed to their own faeces. When these birds are rehomed at the end of their flock life they suddenly become exposed to coccidiosis and then can go on to develop clinical signs. Treatment of coccidiosis generally involves three components. The first is to kill the coccidiosis in the birds to stop further gut damage, this usually involves an anticoccidial medication. The second component is to control the bacterial disruption to the gut, this is treated by antibiotic therapy. The third component is TLC. Providing your bird with a warm dry environment and following any medication it is advisable at this stage to follow on with provision of multivitamins and a probiotic to restore gut flora with a product such as Beryl’s Friendly Bacteria. Prevention as always is better than the cure. The first and most important thing is to ensure that the shed is properly cleaned and disinfected to remove and destroy the coccidiosis oocysts. This involves removing the old litter, using a detergent to remove dirt and grease so that the disinfectant can work and finally using a disinfectant such as Interkokask which is DEFRA approved and licensed to kill oocysts, many commonly used disinfectants are unable to kill the oocysts and will be much less effective. This will stop your young flock being exposed to large numbers of oocysts and their immune systems being overwhelmed. Interkokask and Bi-OO-Cyst are DEFRA approved disinfectant that kills the ‘Oocysts’ (Coccidia Eggs). If your birds get coccidiosis, use this for disinfecting brooders / houses and equipment. You can buy Bi-OO-Cyst online here. You can buy Interkokask online here. The next step is where your birds are placed to stop too many oocysts sporulating (developing to become infective) at once. As stated above oocysts develop under warm damp conditions quickly. Whilst your young birds need heat and we can’t take that away from them we can control the humidity. This involves having good ventilation and keeping the bedding dry, this may involve topping up the bedding or using drying agents such as BioDri. 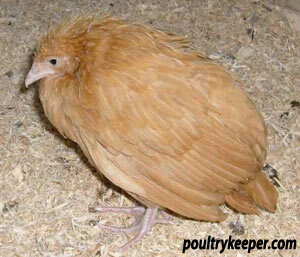 There are a number of bedding materials available for poultry which have been reviewed in another article here. BioDri contains BioVX, which is a DEFRA approved disinfectant. It is environmentally friendly and harmless to your birds. It is usually used on the floor of the brooder before bedding is added to kill off bacteria and keep bedding dry. You can buy Biodri online here. For most backyard producers the above steps should be sufficient to prevent disease outbreaks, however in larger scale holdings medication can be used to control coccidiosis. There are two kinds of drugs: coccidiostats which slow the development of the coccidiosis. This allows the bird to develop immunity to coccidiosis without being overwhelmed. The second kind is coccidiocides, one such medication would be Toltrazuril 2.5% w/v (Baycox) which will kill the coccidiosis. Whilst these may sound better they do not allow immunity to develop and should really only be used during disease outbreaks. This medication is a Prescription Only Medication (POM-V) which means you should only be using it under the guidance of your prescribing veterinary surgeon and it is also not licensed for use in laying birds, which means your vet has to prescribe it under the rules of the Veterinary Medicines Directorate cascade. If it is prescribed to laying bird’s you will have to follow strict rules of withdrawal of eggs. Another commonly used preparation is Amprolium hydrochloride 3.84% (Coxoid) This is licensed under the Small Animal Excemption Scheme (SAES) this means you can buy this product in pet shops and online but it is only intended for use in non food producing animals so again it should only be used under the guidelines of your prescribing vet. For more information on the treatment of your birds it is always best to discuss with your vet. Harkers Coxoid is administered in water. It can be used to kill Coccidiosis but remember it does not allow immunity to develop so should really only be used during disease outbreaks. It should only be used under the guidance of your vet. You can buy Harkers Coxoid online here. A vaccine is available commercially however its administration can be complex and needs the correct environment to work, realistically this is not currently practical for backyard holdings. Finally other poultry can be infected by coccidiosis however each species of poultry have their own species of coccidiosis that infect them. For example the species of coccidiosis in chickens will not cause disease in turkeys or geese and vice versa. The optimum conditions for coccidiosis to develop in chickens are the same for coccidiosis in turkeys so the control and prevention are as described above. If you are concerned about coccidiosis then consult your vet, the Chicken Vet website offers a faeces sample kit, you collect some droppings from your birds and send them to the Chicken Vet laboratory, the droppings are tested for coccidiosis and worm eggs and you receive a result within 48hrs. Richard was born in Ireland and spent time working on his father's commercial turkey farm. He developed a keen interest in poultry, breeding & showing rare breeds. Richard works for St. David's Poultry AKA Chickenvet.